297 Marlborough is located on the north side of Marlborough, between Fairfield and Gloucester, with 295 Marlborough to the east and 299 Marlborough to the west. 297 Marlborough was designed and built ca. 1871 by Frederick B. Pope for speculative sale, one of eight contiguous houses (285-287-289-291-293-295-297-299 Marlborough) built at about the same time. Click here for an index to the deeds for 297 Marlborough. On September 2, 1872, 297 Marlborough was purchased from Frederick Pope by Margaret Elizabeth Ann (Lunt) Williams, the widow of Jarvis Williams, a banker, commission merchant. and manufacturer of steam locomotives. Their adult sons, Charles Jarvis Williams and Reuel Williams, lived with her. They previously had lived at 152 Commonwealth. She continued to live at 297 Marlborough during the 1878-1879 winter season, but moved thereafter. By 1880, she and her two sons were living in Acton. On July 10, 1878, 297 Marlborough was acquired from Margaret Williams by real estate dealer George Butterfield, and on April 18, 1879, he transferred the property to the Lowell Five Cents Savings Bank, which held a mortgage on the property given by Frederick Pope and assumed by the subsequent buyers. By the 1879-1880 winter season, 297 Marlborough was the home of patent solicitor (and former Universalist clergyman) Edwin A. Eaton and his wife Sarah Elizabeth (Slocumb) Eaton. They previously had lived at 130 West Brookline. They continued to live at 297 Marlborough during the 1880-1881 season. By 1882, he had become president of the New England Table Food Company (manufacturers of prepared foods, jams, jellies, and similar items) and they had moved to 2 Union Terrace. During the 1881-1882 winter season, 297 Marlborough was the home of wholesale dry goods merchant Follen Cabot and his wife, Caroline S. (Channing) Cabot. They previously had lived at 37 West Cedar. By 1883, they had moved to the Longwood section of Brookline. On March 29, 1882, 297 Marlborough was purchased from the Lowell Five Cents Savings Bank by Elizabeth B. (Whittredge) Neal, the widow of commission merchant Theodore Augustus Neal. They had lived at 24 West Cedar at the time of his death in October of 1881. During the latter half of the 1880s, Elizabeth Neal was living elsewhere and, by the 1885-1886 winter season, 297 Marlborough was the home of hide broker William West and his wife, Emma F. (Adams) West. They previously had lived at 445 Beacon. They continued to live at 297 Marlborough during the 1887-1888 season, but moved thereafter to the Hotel Vendôme. 297 Marlborough was not listed in the 1889 Blue Book. During the 1889-1890 winter season, Elizabeth Neal was living there once again. 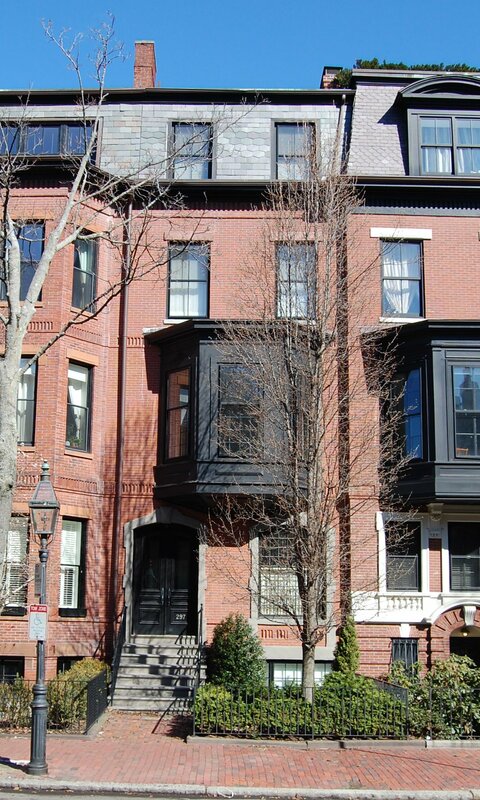 She had moved by the next season, and by 1892 was living at 829 Boylston. On August 29, 1890, 297 Marlborough was purchased from Elizabeth Neal by Dr. Gertrude Wyckoff Van Pelt, a physician and leader of the Theosophist movement. By the 1891-1892 season, Dr. Van Pelt had been joined at 297 Marlborough by Abigail D. (Fletcher) Hersey, the widow of Maine merchant Theophilus Cushing Hersey, and their daughter, Maria T. Hersey, a member of the Board of Managers of the North Bennett Street School. Miss Alice Nichols also lived with Dr. Van Pelt. By 1893, the Herseys and Miss Nichols had moved, and Dr. Van Pelt was joined by Miss S. Mary Norton, an artist. They continued to live there during the 1895-1896 season. By the 1896-1897 winter season, 297 Marlborough was the home of attorney William Minot, III, and his wife, Elizabeth Vredenburgh (Van Pelt) Minot, the sister of Gertrude Van Pelt. They previously had lived at 24 Charlesgate East. 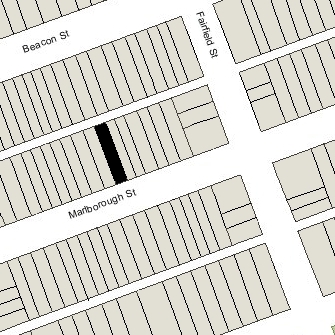 It appears that Gertrude Van Pelt may have continued to live at 297 Marlborough with the MInots. She no longer was listed in the Blue Books, but continued to be listed there in the City Directories through 1899. By 1900, she was living in San Diego, California, and was a physician on the staff of the international headquarters of the Theosophist’s Universal Brotherhood Organization. Elizabeth Minot died in September of 1897. William Minot continued to live at 297 Marlborough with their daughter, Katharine, until about 1899 when they moved to a new home he had built at 409 Commonwealth. He died there in November of 1900. 297 Marlborough was not listed in the 1900 Blue Book and appears to have been omitted from the 1900 US Census. On February 14, 1900, 297 Marlborough was purchased from Gertrude Van Pelt by banker and stockbroker Charles Mills Cabot. He and his wife, Caroline Elizabeth (called Elizabeth) (Perkins) Cabot, made it their home. They previously had lived in an apartment at 405 Marlborough. On April 1, 1902, he transferred 297 Marlborough into his wife’s name. During the 1902-1903 winter season, Charles and Elizabeth Cabot were living elsewhere and 297 Marlborough was the home of his brother, real estate trustee Philip Cabot, and his wife, Lucy Katharine (Fuller) Cabot. They had married in June of 1902. Prior to their marriage, Philip Cabot had lived at 24 Marlborough. By the 1903-1904 season, Philip and Lucy Cabot had moved to 3 Mt. Vernon Square, and Charles and Elizabeth Cabot were once again living at 297 Marlborough. Charles and Elizabeth Cabot’s children — Frances Anne (Nancy) Cabot, James Elliott (called Elliott) Cabot, and Sarah Sullivan Cabot — lived with them. Nancy Cabot married in June of 1914 to Maurice Machado Osborne, an architect, and they moved to Cambridge. Charles Cabot died in September of 1915. 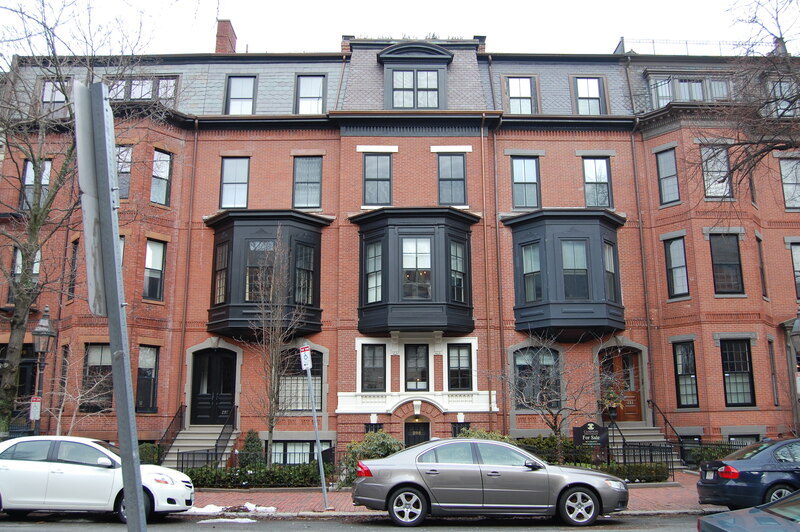 Elizabeth Cabot continued to live at 297 Marlborough with their unmarried children, Elliott and Sarah. During the 1917-1918 and 1918-1919 winter seasons, the Cabot family was living elsewhere and 297 Marlborough was the home of attorney Arnold Scott and his wife, Mabel (Kates) Morrison Scott. They also maintained a home in Dedham, where they had lived in 1917 and were living again by 1920. By the 1920-1921 season, they were living at 18 Hereford. The Cabots had resumed living at 297 Marlborough by the 1919-1920 season. Elliott Cabot moved to New York City in the early 1920s and became an actor. His first Broadway role, in 1922-1923, was in the American premiere of Luigi Pirandello’s “Six Actors in Search of an Author.” Among his other roles, he appeared with Helen Hayes in “Coquette” in 1927-1928. He also appeared in one silent film, “Puritan Passions,” which starred Glenn Hunter, Mary Astor, and Osgood Perkins (son-in-law of Andrew and Mary (Walker) Anthony, who had lived at 196 Beacon). Elizabeth Cabot and Sarah Cabot continued to live at 297 Marlborough during the 1924-1925 season, after which they moved to 367 Beacon. On June 23, 1925, 297 Marlborough was acquired from Elizabeth Cabot by novelist and suffragette Miss Eugenia Brooks Frothingham. She previously had lived in Cambridge, and prior to that (during the 1922-1923 season) at 353 Beacon. She also maintained a home in New Hampshire, first in Dublin and then in Marlboro. From about 1935, she was joined at 297 Marlborough by Miss Dorothy Gilman. Eugenia Frothingham continued to live at 297 Marlborough until about 1961, when she moved to an apartment at 250 Beacon. On September 7, 1961, 297 Marlborough was purchased from Eugenia Frothingham by telephone company executive Frank Henry Rowland, Jr., and his wife, Rose Julie (Cunningham) Rowland. They previously had lived at 349 Marlborough. Rose Rowland’s mother, Claire M. (Brogan) Cunningham, the widow of James R. Cunningham, lived with them until her death in 1968. Frank Rowland died in December of 1998. Rose Rowland continued to live at 297 Marlborough. On August 25, 2010, 297 Marlborough was purchased from Rose Rowland (by then a resident of Newton) by the 297 Marlborough Street LLC (Koby Kempel, manager of record).